Christmas is only 3 days away! Can you believe it? Pretty soon it will be New Year's Eve and it will be time to make another memory jar (lol)! However, before we get too excited, we should focus on Christmas. If you're someone who has all their shopping done and gifts wrap, then you are awesome! With that being said, most of us are probably still making last minute gift decisions and still need to wrap all of those gifts. On top of all of that, you may still need to get stocking stuffers, since those small gifts tend to get lost in the shuffle. Stocking stuffers can either be really easy to find or somewhat difficult if you have already bought amazing gifts. If your someone who is still on the hunt for a few stocking stuffers, I put together a list of 25 Last Minute Stocking Stuffers that you could buy for that crafter in your life. To find out what they are, keep reading below! On a side note, the nice thing about these stocking stuffers is that they are pretty inexpensive and can actual fit in a normal stocking (lol)! When thinking about stocking stuffers, I would go for those craft items which tend not to be given as gifts, since they could be seen as ''not glamorous''. For example, hot glue gun sticks or a pack of buttons. 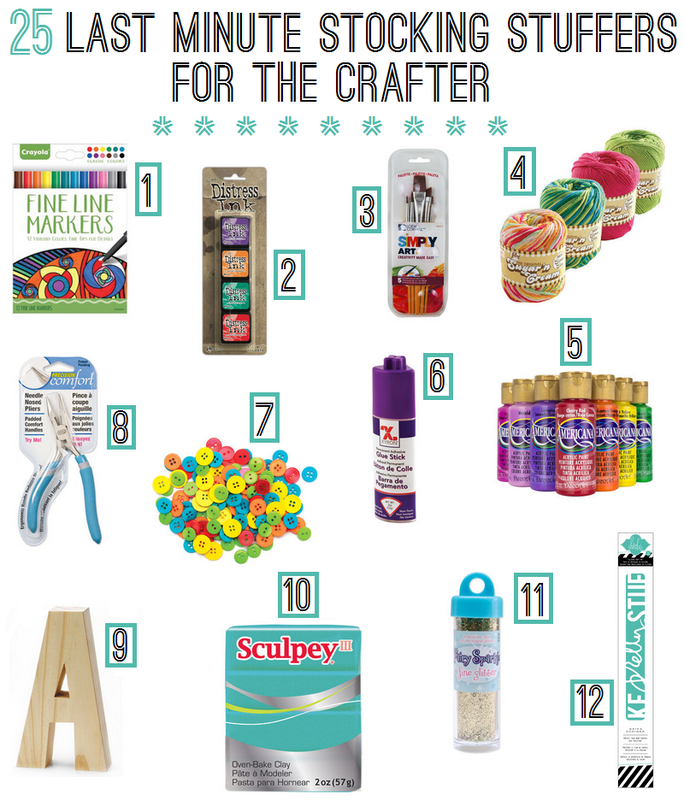 My favorite suggestions out of this list would be the craft mat (12) and pom-pom maker (21). So what do you think? What stocking stuffers would you buy for a crafter? p.s If you need more gift ideas for that crafter in your life, then check out my list of 101 Last Minute Gifts For Crafters!